I had wished for my balcony garden to last through Thanksgiving. Thankfully, it did. The first photo shows the garden a week or so after that holiday; the second, the day before. Meanwhile, I’ll content myself with indoor plants and, of course, thoughts of spring! Though I don’t plan on ordering any seeds till February, it’s not too early for visions of color schemes to dance in my head. My bias toward blue will probably always reign in my garden, but I’m going to look for some different ways to accompany it next time around, as well as experiment with some new blue varieties. One thing’s for sure — I will definitely grow the Nigella again come spring. Not only is its flower true blue, but the foliage is quite interesting, too — delicate and lacy. And, the fact that it lasted all the way through Thanksgiving means it can do double duty in the summer and fall garden. 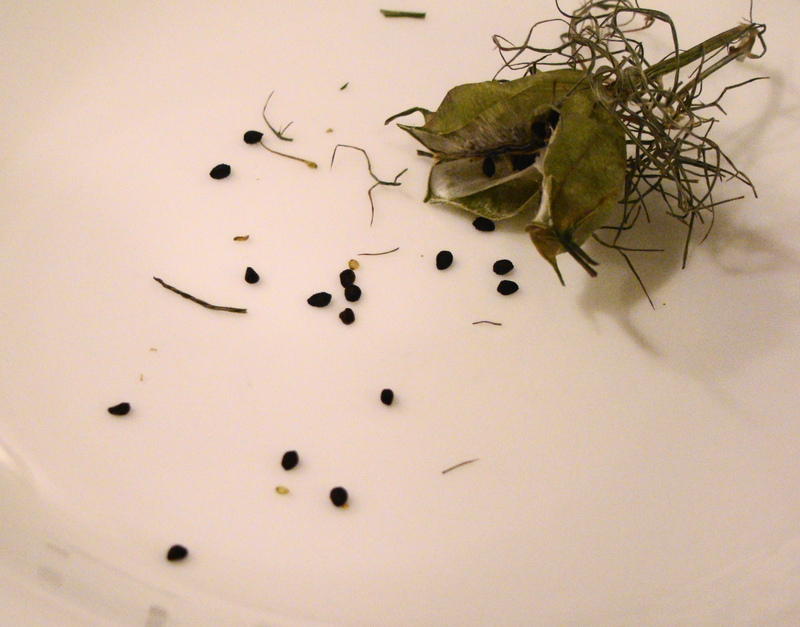 And, even after the Nigella gave in to the cold, large seed pods remained (you can see one in the lower left quadrant of photo three), gifts left so the plant could fulfill its role in the process of sustainable gardening. And, one of my garden blogging buddies informs me that another benefit of collecting seeds from plants that performed well in my garden means that they will likely produce plants that do better in this specific climate than new seeds purchased from a supplier. So, while 2010’s garden is still in the conceptual stages, some seeds are already being planted in the fertile plains of my imagination. What are your early thoughts on next season’s garden? Hi Avis! Nigella is unique and attractive… good choice. Do you think that if you order seeds now, you might get some discount? Just curious he he… Btw, those snow covering your planters look quite nice too. Now you can cut those frosted plants away and put in some Christmas decor 😀 And your net lightings is still there right? Oh wow I am just imagining… But I am sure you have great plans for your balcony already. Hi Avis, I could have sworn I added you to my Chicago/Illinois blog roll some time ago, was surprised today realizing it wasn’t included, and corrected the oversight immediately. An early thought on next year’s garden is adding nigella to it! I’ve been admiring yours since first seeing it. According to the sites I’ve googled it can do well in part sun and dry soil (check!) I’m partial to blue flowers, (check,) and love (one of) its common names (check!) 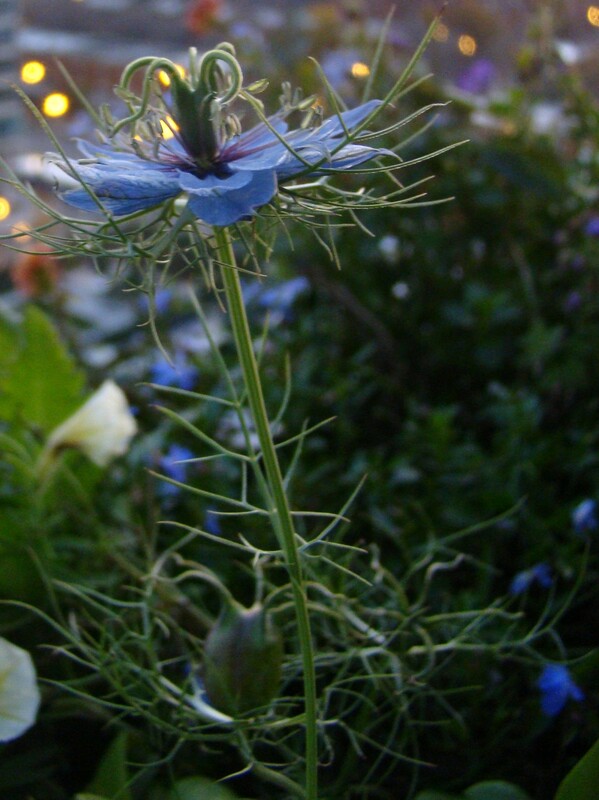 Love in a Mist – how romantic! The foliage is great too (check!) and would add a nice textural contrast here. Congratulations on the success of your balcony garden. I’ve been enjoying following your adventures. Thanks for adding me to your blogroll! I really appreciate it. And I’m glad you’re trying the Nigella. I think I held onto those seeds for about four years before I finally used them, and I hate that I wasted so much time! Congrats on a great garden season and on the seed collecting. I’ll have to grow some love in a mist one of these days. It is just one of those plants I keep putting on growing, but I’ll add it soon. I can’t believe you still had blooms in the snow! Love Nigella. It’s a good “see through” plants allowing other plants behind to peek through. The seed pods are great for winter arrangements. I cut them off after they have ripened and dry them upside down in a dark place. Do you start the seeds indoors before planting out? I’m dreaming of next year’s garden, too. I’m considering a rose garden, which is very ambitious for me! Great idea about using the pods for arrangements! And yes, I did start the Nigella inside using the peat pellets. Cheers! After having a bit of a drab garden this autumn I’m already planning on having more autumn flowering plants next year. I’m also busy looking for new things to grow on the allotment. Next year will be my first full year so I want to make the most of it. 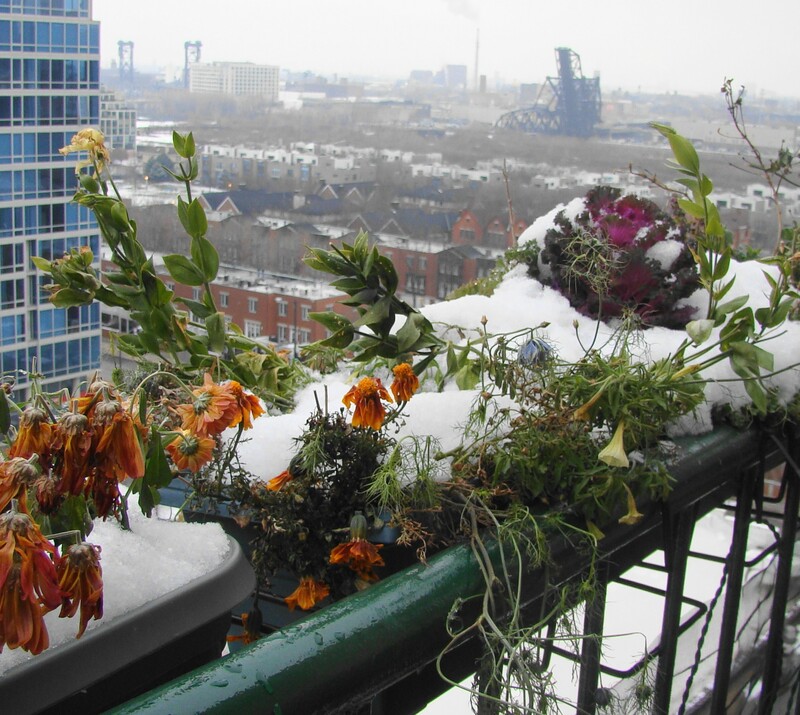 Your balcony has served you well this year. You’ve managed to pack so much into a small space. I love how you manage to grow edibles as well as ornamentals. All the best for 2010. That nigella is really nice – i may try that. 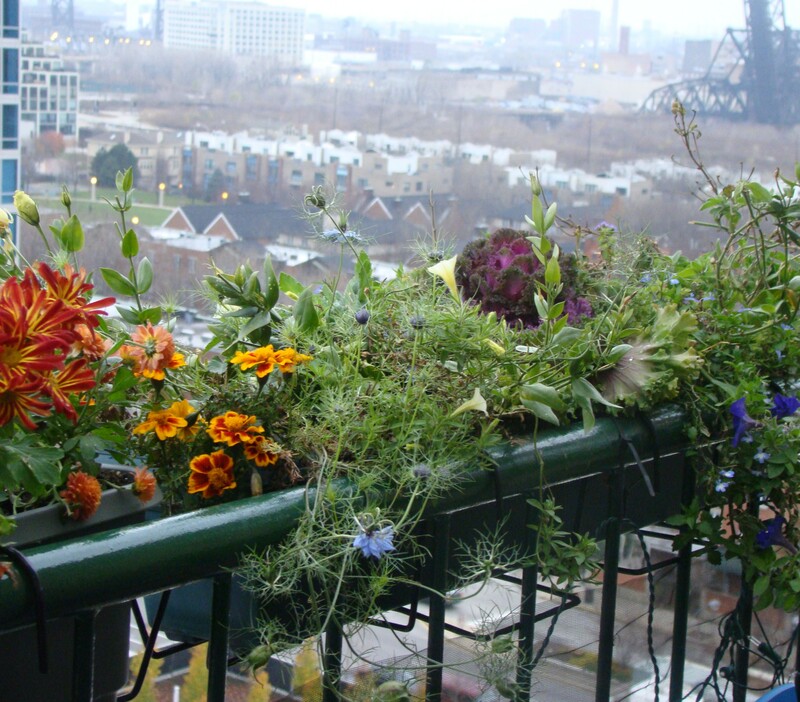 Your balcony flower boxes were gorgeous – what a beautiful combination! We got – maybe…20 inches of snow today – everything is completely covered! I’ve just been inside and finally cracked the spine of a couple of seed catalogs. I’m enjoying the break, but looking forward to the next gardening season!